The article originally titled Support for high school shot clock going strong by Kevin Hoffman was first published by Winning Hoops at winninghoops.com. This summer, my home state of Wisconsin became the latest to implement a shot clock for high school basketball. The change, which won’t take effect until the 2019-20 school year, was met with overwhelming support, despite the growing pains that likely will accompany it. Debate over the high school shot clock has been going strong for more than five years now. 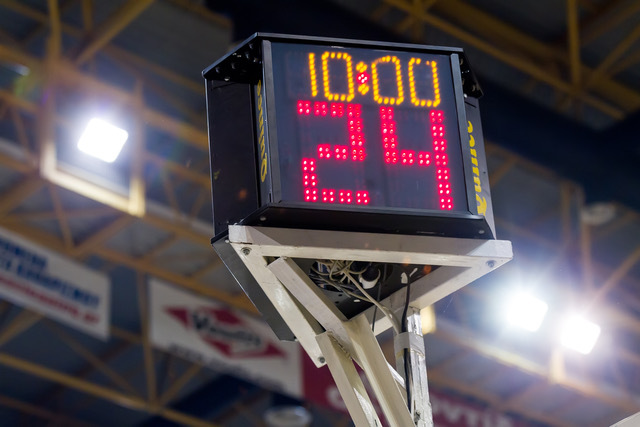 Earlier this year, Maryland approved a 35-second shot clock for boys basketball — the clock is already used by the girls — and Wisconsin followed just months later with its own 35-second clock. Other states, including Texas, have examined the issue without making changes, but the shot clock is gaining momentum. The overarching question is what took so long? Winning Hoops conducted two polls over the past three years asking coaches their feelings about the shot clock, and each time at least 70 percent said they supported it. The Wisconsin Basketball Coaches Association conducted its own survey, showing 81 percent favored the change. Most believe it will improve the flow of the game or better prepare athletes who plan on playing at the college level. Those who stand against the shot clock have valid concerns. There is the cost, which is estimated to be at least $2,000 to install clocks in gymnasiums (Wisconsin is actively searching for a corporate sponsor to decrease expenses). Schools must also find and train clock operators. Then there’s the divide between the strongest and weakest teams. Coaches who don’t have the talent or speed to keep up with their toughest opponents view stalling tactics as their greatest weapon. States have options when it comes to helping coaches and teams adjust, but the truth is an overwhelming majority of coaches in states that already use a shot clock have nothing but praise for it. We often forget that the purpose of high school sports isn’t to win or break records — it’s to play. Your athletes don’t lift weights and put up thousands of shots during the summer so they can play keep-away from their opponents. They want to compete, so let them. It’s possible, even likely, that more states will adopt the shot clock over the next few years. Not everyone will like it, but the best coaches will embrace it as an opportunity and find a way to make it work for their program and their athletes. Comment below or on FastModel Sports social channels whether you think adding a shot clock at the high school level will have a positive, negative or indifferent effect to the game. Kevin Hoffman is the editorial director for Winning Hoops magazine. He can be reached at WHedit@winninghoops.com. Winning Hoops is devoted to helping coaches and athletic administrators at all levels of play develop successful basketball programs. It’s goal is to educate athletic program leaders, providing them with the tools and knowledge necessary to build powerful basketball programs and develop successful student-athletes. High School hoops is NOT more fun to watch because it is being instituted. Certainly not worth the expense, the extra personnel needed at the score table, and the game being stopped because is is malfunctioning, or simply not being effectively implemented — one more item that our game officials have to monitor. The affect on the game, if it’s had ANY beyond officials having to stop the game more often, is to have taken some coaching out of the game. The double FT bonus has gone the way of eliminating comebacks, and has also been a detriment to the game. The 3-pt. Arc, however, has been a bonus. I live in California. Non of that is a problem. Parents or a varsity player runs the clock during Jc games, and parents or a Jc player runs the clock for varsity. We’re supposed to be preparing these kids to vote, responsibily manage credit cards, and pay taxes, but a freaking shot clock is to difficult to operate? That’s silly. While I fully understand that the shot clock is coming and quicker than we all think, I disagree with the arguments supporting it. Our job is to take the kids we have and to teach them how to work together, teaching them skills, strategy, and intelligence to compete against our opponents and to put them in a position where they can do their best to win games. This might mean that a more deliberate style of play because the personnel that a coach has might be more successful due to lesser athletes. I coach in a league and district where teams have superior athletes and to attempt to run up and down the floor in a more uptempo game would be foolish, but to make those teams play our tempo gives us a chance at success. I am not talking about stalling but I am saying a more deliberate style of play which would be eliminated by a shot clock. The team with the superior athletes is given a major advantage if the team is unable to control tempo and forced to play outside of their limitations. If, as your article suggests: ” We often forget that the purpose of high school sports isn’t to win or break records — it’s to play.”, if that is all that it’s about then eliminate coaches and just let kids “play”. It’s about teaching kids how to play and compete within their abilities..
Also, the argument about preparing kids for the next level is ridiculous. Those 5% of kids who are good enough to play in college will have no problem “adjusting” to that play, after all they are the best athletes anyway. This contradicts your point that the game is just to play anyway. IS it our job to prepare kids to play in college when only a rare few will get that chance anyway? When the time comes I will embrace it, but as I have watched college basketball over the course of my lifetime and the reduction of the shot clock, I can’t say that the level of play or skill/strategy etc. has risen as a result of the shot clock, and I do not think the high school shot clock will make the high school game better either. What deliberate style of play takes longer than 35 seconds to get a shot up? That’s an eternity. There are some aspects of play with a shot clock that no one seems to notice: better defense, and fewer end of game fouls. In my limited experience as a basketball official, I have noticed that teams would foul less in games with a shot clock (DC boys, WCAC girls) than in games without a shot clock. This may be because the teams on defense are able to concentrate on playing defense in 30-second chunk, with the knowledge that they will receive possession should the other team fail to make a shot that hits the rim. Fewer end-of-game fouls also means fewer headaches for the officials in trying to determine whether a foul was intentional or not, fewer opportunities for retaliation by the players who are fouled and their teammates, and a more enjoyable experience for all participants involved. Finally, the cost argument makes little sense, because there is shot clock software available for less than $200 that can be downloaded onto multiple computers https://www.pcscoreboards.com/shotclockstandard/ . The cheapest physical shot clock out there, the Ultrak T-200, can be had for between $270 and $300 for a full set of two shot clocks and the controller. I would encourage anyone who reads this, especially if you are an official, to contact your local state rules interpreter about proposing a shot clock nationwide for high school basketball.